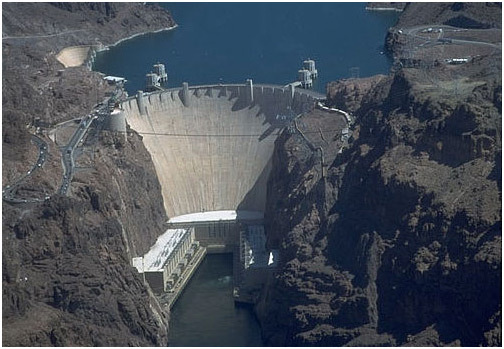 An impoundment hydro site is the one that everyone thinks of when they think of hydro, they think of a big dam like Hoover dam (below) with water backed up behind (the impoundment area), and the head difference between the water behind the dam and the water on the downstream side of the dam creates the power along with the flow of water released. The dam is usually used to store water, often several years worth, and is released to maintain a constant supply of electricity, although they could release water to maintain a constant reservoir level. The water flows into intakes that are part of the dam structure and flows into the turbine with turns creating mechanical power, which in turns a generator creating electrical power, which is then transmitted via power lines. An Archimedes screw micro hydro system can also be used as part of an impoundment site, although Archimedes screw systems are only used on micro hydro sites due to the limits of the technology of a maximum of 10 meters of head and approximately 10 cubic meters per second of flow. When an Archimedes screw is used with an impoundment site the screw can be installed off to the side of the dam, such that the dam is not touched at all, or the screw can even be installed on the dam structure. The Archimedes screw utilizes the head created by the dam, the water flows through the screw, turning the screw with turns the generator to generate electricity. When an Archimedes screw is used with an impoundment system in a micro hydro scheme, water is not released to supply a constant amount of electricity, the screw uses only part of the flow of water that would have otherwise went over the dam. Therefore, the amount of electricity produced can vary.